The New Brunswick Aquarium and Marine Centre is the new home of D'Amour a seal pup that was born in captivity. The New Brunswick Aquarium and Marine Centre is the new home of D’Amour, a seal pup that was born in captivity. 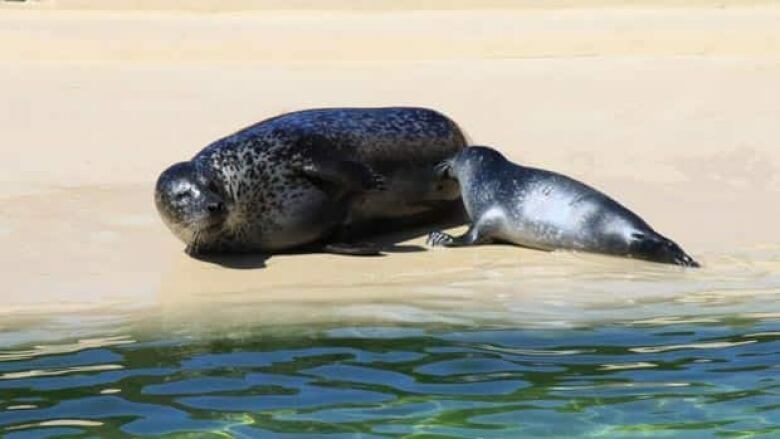 The aquarium, which is located in Shippagan, has a small seal exhibit, which makes D’Amour’s birth special. "The birth of a seal in captivity is rare in New Brunswick," said Agriculture, Aquaculture and Fisheries Minister Michael Olscamp. Laurent Robichaud, the tourism co-ordinator for the marine centre, said the baby seal was about 25 pounds at birth and was roughly four-feet long. The seal was named after well-known actor Normand D’Amour, who was filming an episode of of the television show La petite séduction in Shippagan. Not only was the seal named after the actor, it also has an early love for the camera. "It has a hearty appetite suckling on its mother’s milk during daytime to the enjoyment of the public attending," Robichaud said. "Everything is great up to now as to mother and baby health. It was only a week old by the time the TV crew came along. It certainly isn’t camera shy." Part of the television episode, which will be on Radio-Canada, will focus on the northern aquarium. Robichaud said it is rare for seals to reproduce in captivity, especially in the Maritimes. "It's because aquariums and zoos that have seals in captivity are rare in New Brunswick and the Maritimes. They do reproduce fairly easy in captivity, but we only can hold a certain number of animals for our needs," Robichaud said. The marine centre is marking its 30th year in business in 2012.